The Apple Airport Extreme is my home router and access point. 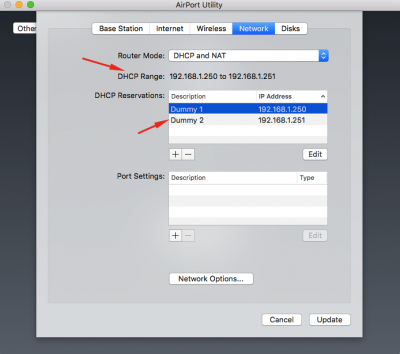 Recently I wanted to use DHCP on my Synology NAS and disable it on the Airport Extreme. 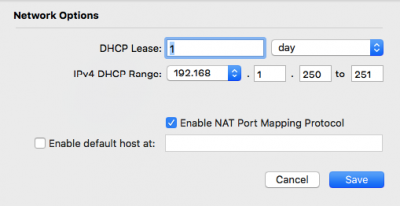 Guess what, when you disable DHCP on the Airport Extreme, it also disables NAT! Not what I had in mind. 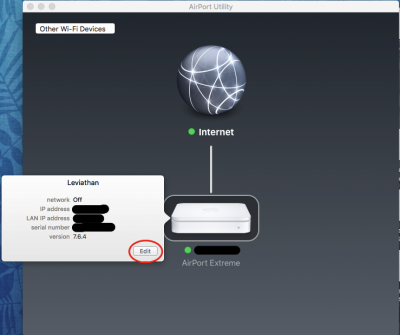 I am a fan of Apple products, and wanted to keep using the Airport Extreme for my WAN -> LAN connection (internet), because I am pleased with the performance and stability. None of the options suited my needs, so what I found out is that I can keep the DHCP and NAT option enabled, but deplete the DHCP servers IP address scope. So basically I am going to setup my DHCP server on the Airport Extreme with a scope of two IP addresses and then immediately reserve those ip’s with fake MAC addresses. This way the Airport Extreme will not be able to serve IP addresses in my network, and I can now setup another DHCP server to fit my needs. In another post I will explain why I need another DHCP server. Let me walk you trough the procedure using the screenshots below. 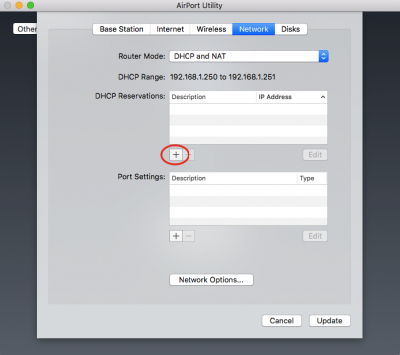 Setup the DHCP scope according to the settings in the screenshot below. The IP address space on my LAN is 192.168.1.x. You can have another range, adjust it to your needs. So I basically setup a DHCP scope consisting of two IP addresses. When you’re done, click on Save. Now we have to add the fake IP reservations. In the DHCP Reservations section click on the + sign. Click on Update and that’s it! 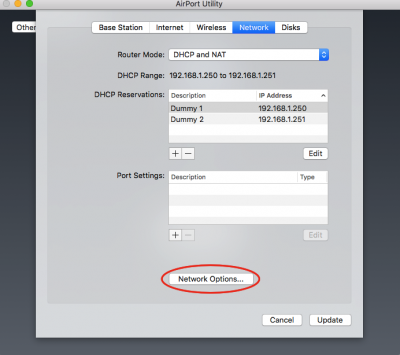 DHCP is now “turned off” on the Airport Extreme, and you are free to use another DHCP server for more flexibility in your LAN.